Rongcha - Bootstrap 4 Template is a modern, responsive, and functional HTML5 template. 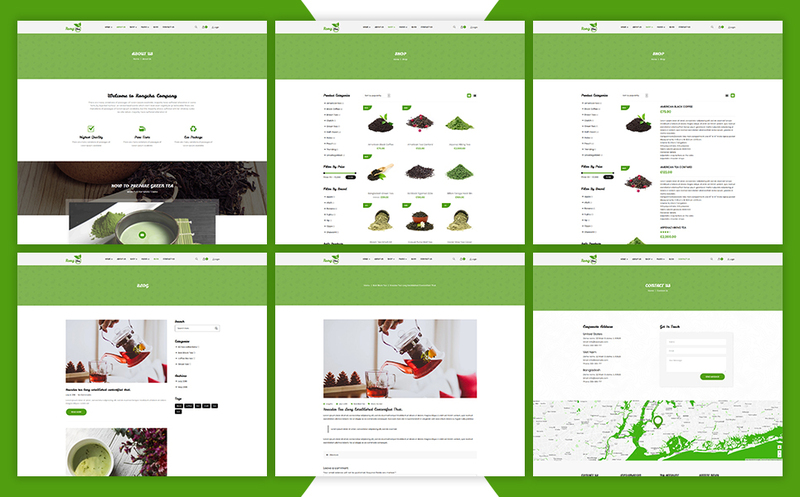 This fresh and creative design is suitable for Tea Company, Online Tea Shop, and Green Tea Store. Rongcha is built based on Bootstrap 4 framework. It comes with two Unique Homepages, along with total 14 pages. Fully responsive layouts are available which include a blog and blog details page. As well as, this tea & drink template has tested with multiple devices.Moreover, Rongcha - Bootstrap 4 Template has features like Full-width Slider, Beautiful Banners to show promotional offers, Trending Product, New Product, Single Product, Product Categories, Sorting and Filter Options, Blog, Ajax Search, My Account, Checkout, Cart, Wishlist, and plenty more. In addition, it is entrancing for its differentiable sections, customization options, and powerful features for multiple purposes. With cross-browser compatible Rongcha, grow up your business!